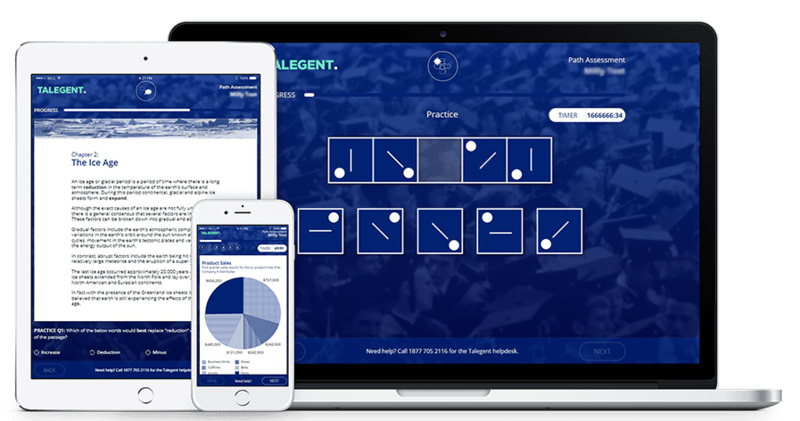 Drawing on Talegent proprietary research, our cognitive ability assessments measure verbal, numerical and logical reasoning — then compare those competency measurements with manager ratings of on-the-job performance in a wide range of specific areas, from problem solving and ability to complete work tasks, to overall work performance. Provides an objective and accurate picture of the performance you can expect from a candidate relative to the specific competencies required by your organisation and/or job roles. By combining cognitive ability and work-style, we can provide fuller insight into how well a candidate will mesh with a given role and your overall organisation so you can achieve the optimal fit. We offer a wide range of cognitive assessments to suit your hiring needs. © 2017 Talegent. All right reserved.